Cisco estimates that the Internet of Everything (IoE) — the networked connection of people, process, data, and things — will generate $19 trillion in Value at Stake for the private and public sectors combined between 2013 and 2022. 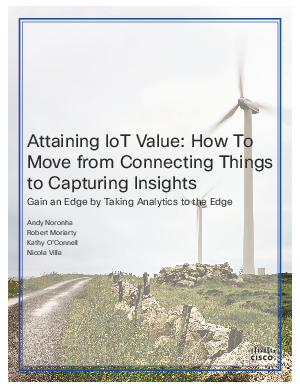 More than 42 percent of this value — $8 trillion — will come from one of IoE’s chief enablers, the Internet of Things (IoT). Gain an Edge by Taking Analytics to the Edge!